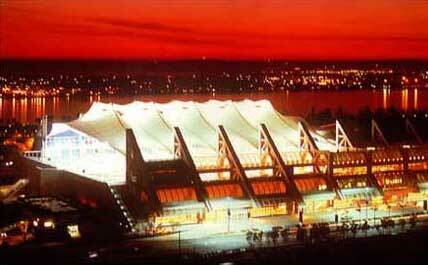 This roof structure has become a landmark for the city of San Diego. It serves exhibits, concerts, and outdoor gatherings. It spans an area of 91,500 sq. ft. without interior supports. Openings in the center of the main roof fabric provide ventilation. A secondary canopy protects the openings against rain, adding to the visual charm of the facility. The structure spans clear across the 300 ft. between the edge piers. Cable supported flying struts hold the roof up, valley cables restrain it against wind uplift. A horizontal strut makes it possible to have the ends completely open. Architects: The Convention Center Architects. Design Consultant and Structural Engineer for the Roof: Horst Berger Partners.